A bipartisan group of senators who have worked for years to improve care for Medicare beneficiaries with chronic conditions scored some big victories in the sweeping budget deal signed by President Donald Trump Friday. The legislation includes a variety of provisions sought by the senators to provide quality care in patients' homes, enhance access to team-based care, launch innovations in benefit design and access to technology, and expand value-based payment for the chronically ill population. Some of the provisions apply to traditional Medicare, some to private Medicare Advantage plans, and some to both. Sens. 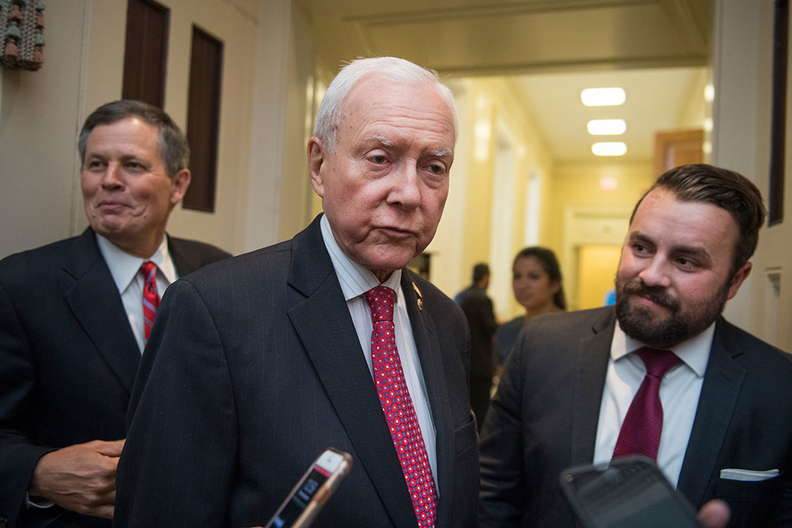 Orrin Hatch (R-Utah), Ron Wyden (D-Ore.), Johnny Isakson (R-Ga.), and Mark Warner (D-Va.) last spring had reintroduced the CHRONIC Care Act—Creating High-Quality Results and Outcomes Necessary to Improve Chronic Care—to streamline care coordination, improve disease management, and reduce medicare costs. The bill was first introduced in 2015. Some observers say the Medicare changes in the budget deal offer a glimmer of hope for more constructive healthcare policymaking in Congress. "We certainly hope there is now more of a bipartisan esprit de corp, particularly around the opioid epidemic," said Margaret Murray, CEO of the Association for Community Affiliated Plans, which represents safety-net insurers. Groups representing Medicare Advantage plans praised the budget bill's provisions, including the permanent reauthorization of the Dual Eligible Special Needs Plan (D-SNP) program for low-income and disabled beneficiaries eligible for both Medicare and Medicaid and the extension of the demonstration for value-based plan design. There are about 2.5 million Americans in D-SNP plans. They also applauded the approval for Medicare Advantage plans to offer telehealth services for the first time. Certain accountable care organizations in traditional Medicare will also be able to receive Medicare payment for telehealth services. The law "offers seniors more flexibility and control to get Medicare Advantage plans that are right for them," said Kristine Grow, senior vice president for communications at America's Health Insurance Plans. "It expands value-based insurance design, to encourage more efficient care that helps seniors to stay healthy." In addition, the law grants a two-year extension of the popular Independence at Home demonstration in traditional Medicare, whose authorization had run out in September. The program, now operating at 16 sites around the country, is testing a service delivery and payment incentive model that uses home-based primary care teams designed to improve health outcomes and reduce spending for beneficiaries with multiple chronic conditions. "We're thrilled that Congress passed the Independence at Home extension," said Rebecca Ramsay, executive director of the not-for-profit Housecall Providers in Portland, Ore., which generated $2.3 million in Medicare savings in the program's first two years while serving 249 patients. "We kept hearing the program had broad support in Congress but the reauthorization kept getting delayed and it's been nerve wracking," said Ramsay, noting that her organization continued providing in-home services during the gap. Patient advocacy groups worried, however, that the law skewed toward helping Medicare Advantage plans at the expense of the traditional Medicare program, such as a provision expanding supplemental benefits to meet the needs of Medicare Advantage enrollees only. "It allows Advantage plans to cover things like grab bars and wheelchair ramps, which is great for folks who need them but should be made available to people in traditional Medicare as well," said David Lipschutz, senior policy attorney at the Center for Medicare Advocacy. Some insurers were pleased that the law expands a Medicare Advantage demonstration allowing plans in all 50 states to establish benefit designs that lower cost-sharing to encourage beneficiaries to seek out high-value chronic care services. Previously, plans in only 25 states would have been allowed to test value-based insurance design. Under the expanded demonstration, Medicare Advantage plans can reduce or eliminate copayments or waive the deductible for high-value services for patients with nine types of conditions, including congestive heart failure, hypertension, and rheumatoid arthritis. "There is evidence showing that cost sharing and benefit design can be important for utilization of high-value care," said Ray Quintero, co-director of the Smarter Health Care Coalition. His group wants to allow value-based insurance design in private high-deductible health plans as well so enrollees can receive certain services without having to meet deductibles or pay coinsurance. But patient advocates worry that without careful guardrails, Medicare Advantage plans could use these types of flexible benefit designs to attract healthier enrollees and discourage sicker ones. "Congress wants to expand a program which has not been tested and about which we have no results yet," Lipschutz said. "And it will make things that much more complex for beneficiaries trying to pick a plan." Another provision of the budget bill would for the first time allow certain Medicare accountable care organizations to pay beneficiaries up to $20 if they seek out qualifying, high-value primary care services. Quintero said that is consistent with his group's concept of providing financial incentives to patients to do healthful things.